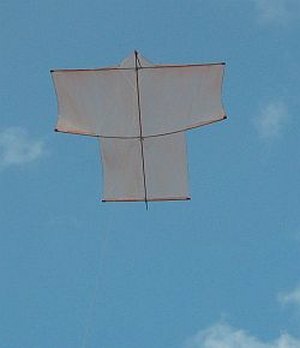 Try the Making The MBK Dowel Sode Kite PDF, if you are interested in making this kite for yourself. Handy for working offline or from printouts. A Light to Gentle breeze was blowing, with big variations in speed near the ground. In fact, holding the meter up at shoulder level for a couple of minutes, it showed an average of 7.4kph over the many gusts. One gust went just over 14kph. A massive tree trunk provided some shadow from the breeze while I rigged the venerable Dowel Sode. The now-brittle plastic again split near the nose section as the rig progressed. Out with the sticky tape as before! Catching just enough breeze to pull the Dacron line through my semi-open hand, the winder danced around on the grass as loops came off. In this way I allowed the kite to move slowly out over the field until about 20 meters (65ft) of line was out. From there on the kite rapidly gained height as stronger wind caught the sail. Rising air was in abundance so it wasn't long before the Dowel Sode kite was soaring around on a very steep line. With 60m (200ft) of line this meant the kite was very close to flying at 200 feet above the grass. Some video was taken, on nearly 4x zoom, which will get posted later. Time to go onwards and upwards... In no time the kite was doing the same things 100 feet higher still, on 90 meters (300ft) of line. The bright afternoon sunshine lit up the pale orange sail and in the strongest gusts some fluttering of sail plastic could be heard. From way up there - it still surprises me sometimes. I guess Adelaide doesn't have too much noise pollution! Back home again, the weather station recorded the Westerly blowing at 14kph with gusts to 17kph. A short but most enjoyable outing with the Dowel Sode. A quick check of the weather site confirmed that the wind was around the gentle / moderate boundary. 16kph gusting to nearly 25kph. Tolerable for the more robust of my light-wind Dowel kites - the Barn Door, Sode and Dopero. The Barn Door is still in the tree that claimed it months ago and pure laziness eliminated the Dopero. Well, time was a little tight as well, so the Sode it was! A gusty Westerly disturbed the tree leaves from time to time as I set up the Sode. In a few minutes it was rigged and tugging away at the line, buffeted by the wake of trees and buildings. Soon, it was straining away on 30 meters (100 feet) of line. Less turbulence up there, but still plenty of thermal activity moving the kite around. I just observed it for a while, looking for any signs of leaning one way or the other. But no, the trim seemed fine, so out went more line to 60 meters (200 feet). In no time at all, the kite contacted some rising air and went up like an elevator. Almost a couple of minutes were spent directly overhead. At one point it threatened to keep going past vertical! This was slightly uncomfortable since in some directions the trees were quite close. But the kite behaved impeccably. Next stop - 90 meters (300 feet). However, I didn't notice the 90 meter flag going out and ended up with 120 meters (400 feet) out instead! Again, within just a few minutes, the kite shot straight overhead and wandered about with the line sometimes tight and sometimes with a little slack in it. I wished I had the camera, because there was an ice crystal weather effect. Like a huge but faint rainbow completely encircling the sun. The big Sode moved in and out of the rainbow as it flew overhead. Spectacular! Meanwhile, the wind meter, sitting near the ground, recorded just over 4.5kph gusting to 13.1kph. Higher up, it felt very much like the 20ish wind speeds displayed at the weather site a little earlier in the day. This kite rolls up so neatly that it looks like a long orange pencil when you are carrying it around! Another short but very enjoyable flying session while the small son enjoyed his soccer practice a few blocks away. This time it was the Sode's turn to be brought out of moth-balls for a fly. After setting up the wind meter on its tripod and rigging the kite, launching was easy in the gusty breeze coming through between the scattered trees upwind. Out to about 30 meters of line, I just let it slip fast enough to maintain a 40 degree line angle. Flying about on 60 meters (200 feet) of line, the big Sode surged around and quivered occasionally in the rough air. No dramas, although the line was tight in the almost moderate strength wind up there. Then I had a bit of fun, shaking line off the winder with my left hand while controlling the slippage with my right hand. This was done fast enough to allow the kite to sink down to a mere 15 or 20 degree angle, far away on 90 meters (300 feet) of line. Once there, I just hung on while the kite did a magnificent fast climb, weaving gently on its way straight up to 60 degrees. Not content with a mere 90 meters, I continued to let line out slowly until the Dowel Sode finally sat almost motionless up around an altitude of 350 feet above ground. The breeze was smooth and moderate in strength up high. The line was pulled tight and sagged by only 5 to 10 degrees. I can't actually remember ever flying this Sode in such smooth air before. There it was today, 'nailed to the sky', until I decided to take it down about 10 minutes later. Passing down through 250 feet, the line tension quite suddenly slackened off - but just a little. Then again, below 50 feet, the line tension decreased further and the Sode started shifting around and quivering in turbulence from the trees and houses upwind. With the kite on the ground, a quick check of the wind meter showed an average wind speed of just 3.7 kph near ground level, and a maximum gust of 12.4 kph. It felt like a steady 15 or 18 kph up high though! According to the online weather, winds were in the bottom half of the Gentle range. Beautiful. The Sode would soar effortlessly in that. On arrival at the field, a few minutes were spent patching up the fragile thin plastic sail of the Sode. UV radiation eventually takes it's toll on plastic kites - but not before you get many hours of flying time out of them. I've had this Dowel Sode for years now, so it's feeling somewhat geriatric. In due course, the kite leaped into the air on a short 20m (60ft) or so of line, for some video to be taken. On 20 pound braided Dacron, the Dowel Sode is an amazing performer - a credit to the centuries-old Japanese design. Would everything hold together? Thermal activity was roughing things up too, causing the kite to suddenly lose pressure and swing nose-down from time to time. However, the Sode is a very stable design and it always climbed right back up. Almost overhead at times, as rising air pulled ferociously at the sail. Another question - would the 20 pound line hold?! It did. Just can't keep away from roof-top flying... Today it was the Dowel Sode. The breeze was quite gusty but I thought it was worth a try since the Sode is very stable once trimmed. After things got rather hairy on 5 meters (20 feet) of line, I put the kite up again on just 2 meters (8 feet) for a while! Eventually it was time to pack up. Quit while you are ahead. 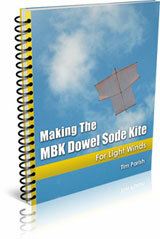 Don't forget to try the Making The MBK Dowel Sode Kite PDF, if you are interested in making this kite for yourself. Handy for working offline or from printouts.